We just can’t help ourselves lately, ladies, there’s been so much good stuff stocked in our House of PlumRed online boutique lately, we just have to continue to share the goods with ya! Plus, we’ve been topping the charts with over 1,000 followers on our Facebook page that we’re also wanting to share some love by showing off a little bitta this and a little bitta that, fresh from our own style closet. Denim is uber in at the moment–a trend that just keeps comin’ back (thank you 80’s)! Well, this dress is no blast from the past actually–but one ‘Demure Denim Dress’ that will rock any event you have to attend, even if you’re just lookin’ for a good date-night outfit. 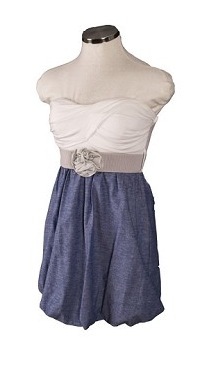 The faded denim bottom is paired with a sweet cream criss-cross top and fabulous belt accessory. Sweet sweet nothings might just get whispered in your ear when you throw on this ‘A Touch of Lace Dress‘ from the House of PlumRed boutique! The v-neck and empire waist combo on this romantic dress make this one piece that is ultra flattering–and easy to pair with any shoes in your closet! The lacy floral pin embellishment even acts as a hair or dress accessory! How fab! 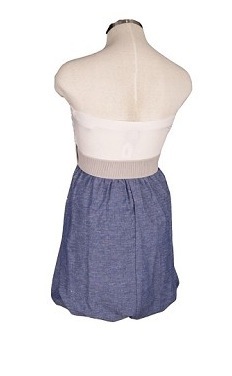 Check out the dress in our feature on CREATE blog. And if ya wanna glam up that dress-ready look a few notches, then you’re gonna wanna purchase these fine gems! The ‘Orange Tree necklace‘ out of House of PlumRed’s Accessories Collection adds a beautiful touch of fresh, orange-y sparkle to your summer look. 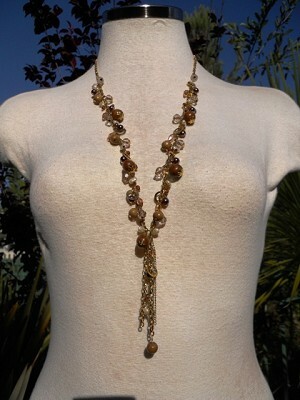 Long gorgeous clusters of golden & orange adorn this long chained necklace. Great price too! 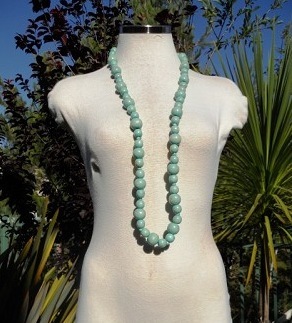 And check out this wooden-beaded ‘Dip N Dot necklace’–priced at just $5.80! Adds a bright & colorful hue to your workplace wear or weekend casual wardrobe. 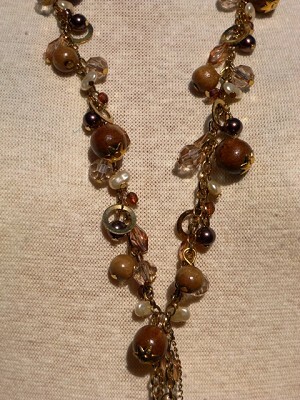 A long strand of colorful beads thrown over even your basic white tee + jeans outfit is a big style hit this summer! Don’t forget, ladies, House of PlumRed boutique is giving you FREE SHIPPING for orders over $50! You can get a ton of new tops, bottoms, dresses, outerwear and accessories for 50 smackers in our little boutique, so stock up now.